The search for primates is about to begin. You’ll go trekking through the forest to watch playful chimpanzees swing between the trees. You’ll spot female blue monkeys picking bugs off each other and eating them. You’ll stand completely still to watch a colobus monkey nurse its all-white infant. You’ll visit the Congo Hounds, a canine anti-poaching unit, to learn how they patrol the park. Then you’ll spend time at a gorilla center to see massive mountain gorillas up close. If it weren’t for these animals, you probably wouldn’t venture into Virunga National Park. Though it was established as Africa’s first national park—and ultimately became a UNESCO World Heritage Site—the park wasn’t safe for many years. It’s in the Democratic Republic of the Congo. The Central African country, formerly known as Zaire, has been immersed in civil wars for decades. The fighting has diminished in recent years, but the protests and the political instability continue. Poaching has decreased and conservation efforts have increased in the national parks, as well. So, after many years of dreaming, you finally booked a flight to the DRC. The ride from Goma to Rumangabo is long and bumpy. The village sits on the northern edge of Virunga in a rift valley full of dense forests. Mount Nyiragongo and Mount Mikeno, two volcanoes, loom in the background. It’s known for its military base and national park headquarters. It’s also where you’ll find the best lodge in not only the park, but the entire country. Mikeno Lodge is run by the national park service, and all profits are put toward conservation. You’d want to stay here anyway. 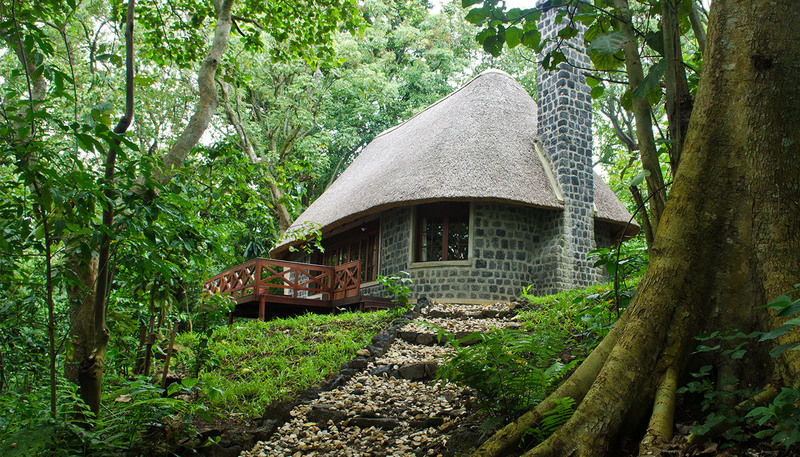 Its 12 bungalows, made of volcanic stones with thatched roofs, are adorable. They have wooden furniture and soft beds, stone carved baths and showers. You won’t see any other people from the decks, though a few curious chimps may visit. While logs in the stone fireplace will be crackling when you return from dinner each evening. But, right now, dinner is a long way off. It’s finally time to find those primates.